On Friday 14 November, we launched a partnership with TechHub Swansea which will see us working with local businesses, suppliers, customers and universities to design and develop digital services over a 2 year programme. We’ll be investing in the future of ’home grown’ IT businesses in a move that promises to reduce our reliance on multinational IT firms. We’ll also nurture the development of unsung British developers by forging links with technology start-ups in the region. This aligns with our strategy to develop and attract digital talent. This investment could be the tip of a very large and exciting iceberg. There’s no question that Britain generally, and Swansea in particular, could be home to some of the most talented software developers in the world. This partnership will help build a community of subject matter experts where knowledge and skills can be shared. In the coming months, up to 40 of our staff will carry out project work in Techhub Swansea’s offices. We’ll be using the cutting edge digital skills of graduates and tech start-up gurus to better the services we provide to the public. 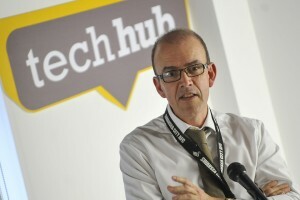 As well as upskilling our own staff, TechHub will allow us to offer placements and projects to undergraduates. We’ll also mentor a number of start-ups and software projects by sharing our digital knowledge and experience. As part of our 3 year strategic plan, we’ve also established links with local colleges and universities in a bid to spot talented graduates who could work with, or for, us in the future. It's great to see stuff like this happening - a very cool initiative.